Starting in April of each year, professional and retail Investors ask themselves "should I sell in May and go away"? Although many point to Stock Trader's Almanac statistics that illustrate the stock market's tendency to provide lower returns in the period between April and October, the explanations behind the phenomenon are often missing. Market statistics only show what happened in the past, they don't provide any explanation of why the event occurred. Calendar effects, such as "sell in May and go away", are not uncommon in the stock market. Such trends can be seen at the end of the year with the "Santa Claus rally", beginning of the year with the "January effect" and every few years during U.S. election cycles. Despite the fact that some market participants deem these market timing concepts (or adages) as credible, academia does not. The concept of "sell in May and go away" contradicts established market philosophies such as Efficient Market Theory. As academia shifts towards the study of behavioral finance these calendar effects may be justified through psychological concepts such as herd behavior. This type of behavior can be characterized by the tenancy of individuals to act collectively and to mimic the actions of a larger group. So if we think that the group is planning to sell their positions in May, why shouldn't we follow the herd? If the masses believe a May sell off will occur, it will. If the market has more sellers than buyers, the market falls. The falling market will trigger other market participants to sell their shares. Given our tendency to anticipate a May sell off, we sell our shares (or at least raise our stops to lock in profits). In my opinion, this is how adages concerning market timing become self-fulfilling prophecies. Should I Sell in May and Go Away, or Not? Making the decision to lighten your exposure to equities should be based on your financial plan. First, understand or remember why you are investing in the first place. If you are trading, the decision to exit a positions should be based on price action of the asset, not time of year. Your trading strategy (entry and exit points) should dictate the time to sell. In addition, if you are a long-term investor whom is seeking capital appreciation to fill financial planning gaps you should avoid the temptation to sell during short-term stock market fluctuations. In simple terms, just stick to your original plan. In summary, the decision to sell or lighten stock positions should be based on price action and macro-economic assessments. While statistics do support a "sell in May and go away" approach, it's not significant enough to warrant the blind abandonment of positions. Take these anticipated calender driven stock market events with a grain of salt. Stick with your financial plan, keep your eyes open for changing trends and adjust as needed. There are two emotions that tend to cloud our judgement when making investment decisions: fear and greed. We can be both fearful of losing money and missing out on the opportunity to make more. Additionally, greed may influence you to invest more capital than you really should, thus wreaking havoc on your financial plan's risk management strategy. The world's best investors and traders have honed their ability to minimize the impact of emotion within their investment decision making process. The following quote from Warren Buffet characterizes the need to take a counter-intuitive approach to emotion when investing; "Be fearful when others are greedy, be greedy when others are fearful". In other words, investors should sell stocks when the market is overbought (greedy) and buy when the market is oversold (fearful). While the concept of "buying fear and selling greed" is obviously a sound and statistically valid method of timing the market; determining when the market is fearful and greedy can be difficult. In theory, if investors and traders could identify these broadly defined points in time, they could be handsomely rewarded for their savvy. 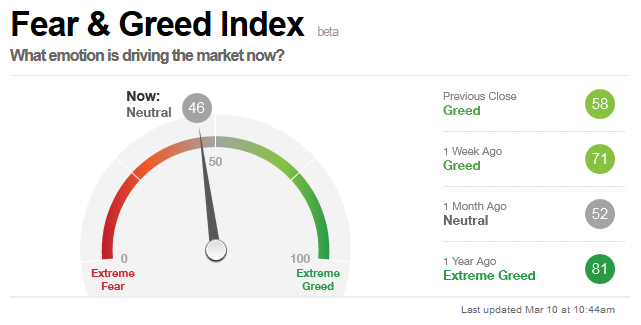 In an effort to measure when the market is fearful and greedy CNN Money has created the Fear & Greed Index. What's Inside the Fear and Greed Index? Stock Price Strength: This measure compares the volume of stocks hitting their 52 week high vs. the volume of stocks hitting their 52 week low. Greed is indicated as more stocks begin hitting their 52 week high, or are at least trading in the higher end of their 52 week price range. Junk Bond Demand: This measure is determined by the spread between the yield demanded by investors for junk bonds (high risk asset) and the yield demanded for lower risk corporate bonds. As fear begins to spread through the market, investors begin to demand a higher yield for riskier assets. Fear is signaled as the yield spread between riskier bonds and their safer counterpart increases over historical averages. Safe Haven Demand: This indicator measures the relative performance of bonds (low risk and "safe" asset) as compared to stocks (high risk asset) and subsequently the demand for each type of asset. As investors become greedy they will begin to sell bonds and allocate a higher percentage of their portfolio to stocks. Stock Price Breadth: CNN's Fear and Greed Index uses the McClellan Volume Summation Index to measure advancing and declining volume on the New York Stock Exchange (NYSE). Fear in the market will be indicated by an increases in selling volume (more shares sold than bought). Market Volatility: The index uses the Chicago Board Options Exchange (CBOE) Volatility Index (VIX) to measure market volatility. The VIX is often referred to as the "Fear Index", however it measures implied volatility in either direction (bullish or bearish). Put and Call Options: The fear and greed index uses the put/call ratio to compare the volume of bullish call options verses their bearish counterpart the put. As investors become greedy they will begin to buy more call options and less puts. Market Momentum: Market momentum (whether bullish or bearish) is measuring the S&P 500's (SPX) price versus it's 125-day moving average. Greed is indicated as price moves further above its moving average, and thus fear is indicated as price momentum accelerates below it's moving average. While I like the simplicity of the Index and the methodology they used to measure the fear and greed in the market, however I do have the following suggestions. First, I would like the ability to easily compare historical S&P 500 price data with the index's output. I would use this data to uncover any statistical significance between the two for use in probabilistic simulations. Second, I would like to be able to vary the time frame of the index. Providing the ability to measure the fear and greed in the market in different time frames would appeal to a wider population of investors (day and swing traders, buy and hold investors, etc.). Finally, I would like to understand how each of the indicators were weighted and have an option to vary that weight. Recently I've been looking for a reason to reduce my exposure to securities and increase my cash reserves. I've been searching for a signal of a future stock market correction to confirm my suspicion that the U.S. stock market is overbought and frothy. It's commonplace for analysts (and other humans for that matter) to look for and find data that confirms their suspicions, this is known as confirmation bias. I try to remind myself of the potential of such a bias when I start to stretch an indication or signal that will confirm my forecast. The market has been consolidating in the past few months, with a breakout to all time highs in the last few weeks. The breakout proved that my gut instinct was wrong and further reinforced my understanding that it's difficult to time the stock market. However, today I noticed a signal that could be used to support the hypothesis that the market will correct in the near future. 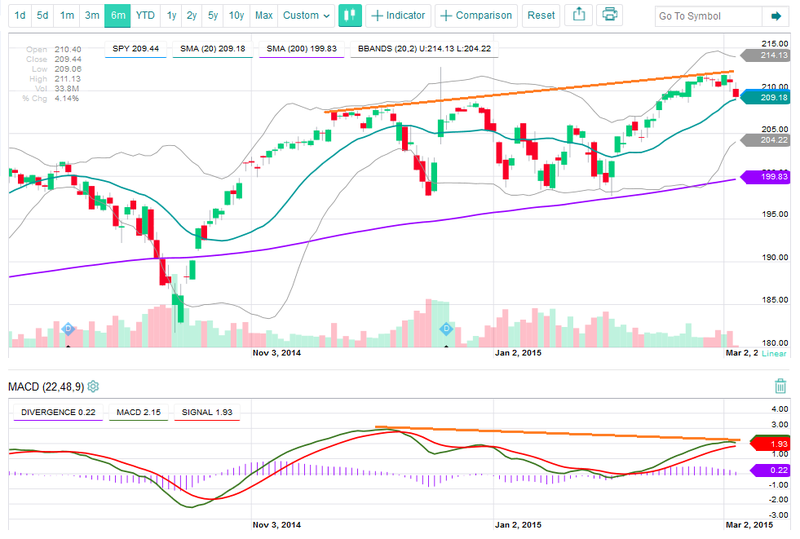 This signal was the bearish divergence between the price of the S&P 500 (SPY) and it's momentum (which is measured by the Moving Average Convergence Divergence (MACD) indicator). The bearish divergence is illustrated by the orange lines in the image below. Notice how price is increasing while momentum is decreasing over time. It's wise to be skeptical of this bearish divergence signal due to the fact that many strong market up-trends include long periods of bearish divergences. This is due to the market's tendency to move higher even as it's momentum slows. This common occurance is illustrated in the following chart. As you can see, the MACD is signaling that momentum is slowing; a change in trend could occur in the near future. However the market continues to move significantly higher for a year. So that begs the question, "has my suspicion been confirmed"? Nope, not even close. In the short-run, prices could continue to slide until they (1) find support on prior price resistance or (2) fall through prior support and start a new trend lower. Only then would my suspicion be confirmed. It should be noted that any reliance on this indicator over the long-term would prove less than optimal. As the case with any single indicator, using a bearish divergence signal should be utilized in combination with other indicators to help in the confirmation of a change in trend. The value that this indicator provides is that it can warn of a change in trend in the near future. At that time other technical analysis techniques such as breaks in prior support level should be used as a signal confirmation. I consider timing, rather than a company's fundamentals (earnings, margins, debt, financial ratios, etc. ), as the most important element in the investment decision making process. When investing in a great and fundamentally sound company, the wrong timing or entry point can still turn a good investment idea into a painful loss. Many professional investors and traders will view the market and individual securities through three different time frames before deciding to put capital to work. Analyzing the market in these time frames can help avoid losses and maximize profits. The following methodology can be used to improve your investment decision making process, however it should be revised as need to reflect your personal investing and trading goals. Start your market or security analysis by looking at price charts with a long-term time frame. Many investors and will use the monthly chart for this high level of analysis. The following long range view can help determine if the market as a whole is moving higher or is in correction (use an index for this type of review). It's best to invest when the market is moving higher in a solid trend. When the market is in correction it's wise to move to a cash heavy allocation until the positive trend continues. This is due to the fact that most stocks move in the same direction as the market, rearguards of individual fundamentals. When viewing a broad market ETF in this time frame, I would consider the market in a major correction when price falls below the 20 period moving average. After you have determined that the market as a whole is in an uptrend you can drill down into an intermediate time frame. I like to move from the monthly charts to a weekly chart for this level of trend analysis. In this view you will be able to determine if the stock is overbought, oversold or is close to it's mean based on technical indicators. This is also a good time frame for finding price levels that may serve as resistance or support. Regardless of the benefits of using a intermediate chart, I spend most of my time analyzing price action in short-term time frames. The lowest level of time that I will analyze the price action of a security is at the daily level, this is my personal short-term time frame. More often that not, day and swing traders will start their long-term trend analysis at the daily charts or lower (hourly, etc.). However, like I said, we are looking for good entry points on our investments not trade set ups. I like to look at my daily charts with a 6 month time frame, as I've shown below. The 6 month daily chart provides me with the last bit of information that I need to complete my personal investment decision making process. When analyzing the price action at this time frame, I look for positive price indicators such as price in relation to the 20 and 200 day moving averages. I also pay close attention to the Bollinger bands to gauge recent volatility and momentum. Attempting to time the market perfectly is a fool's errand. Analyzing the market and individual securities in a variety of time frames can help you choose better entry points for your investments. Deciding to include time into your investment decision making process will dramatically improve your chances of making wise investments. In the past 10 years I have used a variety of charting tools (TradeStation, NinjaTrader, etc.). I loved NinjaTrader; however I need to be able to access my charts from a web browser and not have to rely on a local program installed on a hard drive. NinjaTrader has tons of 3rd party indicators that notify you of trade opportunities, there are some really awesome ones. The NinjaTrader platform also includes a bunch of trade management features, but I'm not a day trader and really don't need any of them. In the past year or so Yahoo Finance has spent some time upgrading their charting to a level that's, in my opinion, good enough for the average investor. 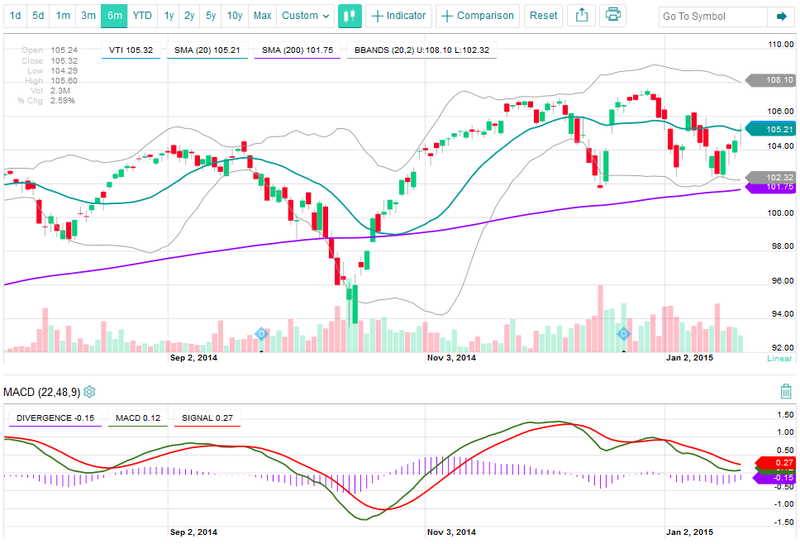 Yahoo's finance charts don't offer a lot in terms of technical indicators, however I rather have a simple and easy to read chart over one that is filled with tons of difficult to read indicators. As you can see the chart is rather simple, however it displays enough information to help determine wise buy and sell points for the average investor. The best traders will use hard rules to determine when to enter and exit a position, this helps remove the emotions of fear and greed from their decision making process. Additionally, the best investors will use similar rules (not as hard) to help determine the right time to buy a security. This Yahoo finance chart setup helps me find the best time to enter a position. In my next post I will describe the rules I use when making decisions based on these chart parameters.